Am now ready to announce the winner of this marvelous typographic poster, based on the periodic table. The designer, Camdon Wilde clearly onto a classy winner has now come up with version 2, in a stylish black and silver version. Congrats to Chuck alias Charles Riccardi (@charlesriccardi). You have won this most excellent poster. 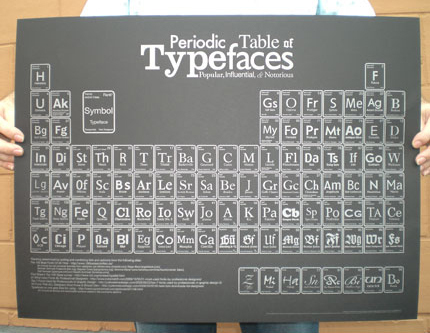 If you didn’t make it this time, don’t worry too much, I will have another giveaway in the next few weeks..
Poster article originally found on FPO : For Print Only ‘Periodic Table of Typefaces Poster‘. The amazing photographs of this poster also created by FPO and the above link will take you to the rest of the amazing poster photos. If you can’t wait to see if you will be the winner, you can head over to http://www.squidspot.com to purchase this awesome poster.